Hey lovelies! Today’s post is inspired by my mother and sister in-law who live in New Jersey. They ALWAYS have the best edgy style and are true sassy Jersey Girls wearing leather, fringe, leopard, capes and all the sassy things. So today’s look is inspired by these two beauties. Faux Leather: this is a must. The more leather, the better. Very similar to dressing like a New Yorker (get those tips here). I love the faux leather panel on this $35 Charming Charlie little black shift dress. No need to break the bank ladies! Leopard Print: #DUH – the word sassy basically was made for leopard print. Incorporate it into your look. Also – check out how my girl Janna is wearing this SASSY leopard skirt!! LOVING that girl!! She’s also got some great tips about trying the print for the first time. Leopard is my favorite fall neutral as seen here last year. A Cape with Fringe: capes are ALWAYS so chic and these two ladies have the most amazing cape selection in their closets. It’s an essential for any sassy Jersey Girl look. This black and white cape is also Jersey Girl #GOALS. Something Uber Trendy: right now, chokers are SO trendy and making a total come back. Add your own style to the trend. For me, I love all things glam, so I went with a gold layered choker instead of a traditional black leather choker. I also rocked a leather tassel choker in this post. Badass Shoes: whatever shoe you choose should make you feel like a total sassy badass. I chose these open toed, high heeled leather mules. Bonus: I got them on sale at TJ Maxx for like $20. The perks of living in NH where no one wears heels. I wish I were kidding LOL. 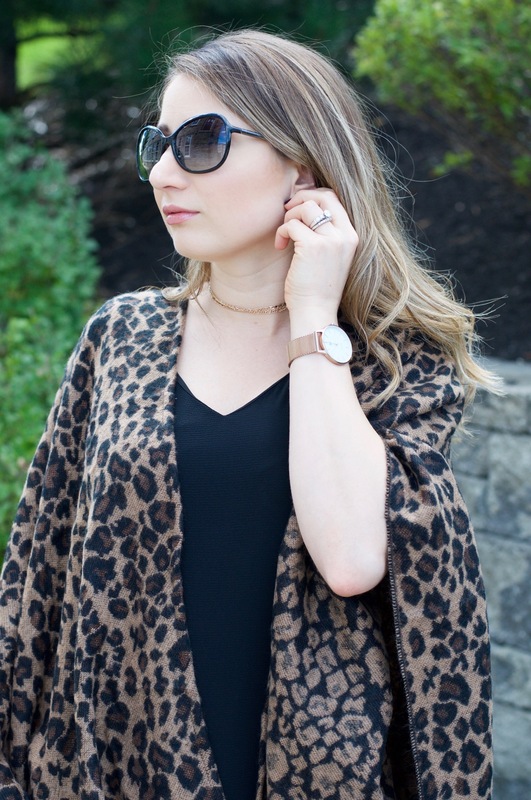 Leopard Cape, only $29 and a best seller from Charming Charlie. Faux Leather Shift Dress, only $35 from Charming Charlie. Gold Chain Choker, only $8 from Charming Charlie. Rose Gold Watch (use code anniespano for 10% off and it’s yours for $112.50). Tassel Bracelet from Fall BOS (use this link for $10 off).